An Israeli military spokesman says the Israeli Defence Force (IDF) should have been able to tell that four boys it killed on a Gaza beach last week were not Hamas operatives. The four boys from the one extended family – Zacaria, Aahed Bakr Jr, Mohammed and Ismail – were killed by a rocket strike while they played. “The IDF had a target, a Hamas terrorist target,” Lieutenant Colonel Peter Lerner told the ABC’s 7.30 program. “We had intelligence pointing specifically to that location and we had the indication that the perpetrators were on the beach. We had a specific target indicating that they were supposed to be there. Lt Col Lerner did not provide detail about how long the boys were being observed or by what method. “We need to determine what happened between the gathering of the intelligence and what happened that caused this unfortunate human tragedy,” he said. While the Israeli military continues its official investigation, the extended family of the four boys is devastated. 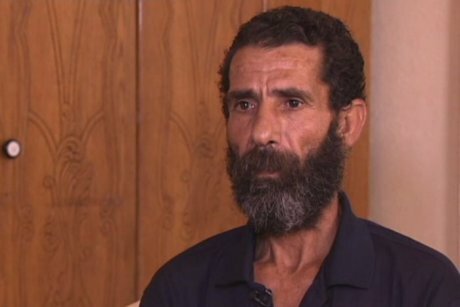 Aahed Bakr, the father of Zacaria, still cannot comprehend what happened. “I found my kids dismembered. Innocent kids dismembered – it was carnage,” he told 7.30. Mr Bakr’s wife, Um Ataf, is inconsolable and he admits that privately he, too, is struggling. Mr Bakr is a fisherman and his family has a long and strong connection with the sea. “Every day [the children] were going [to the beach] to play, to check the boats, to relax a bit, to see other fishermen, to play with other kids, to swim,” he said. His son, Muntaser, Zacaria’s brother, was at the beach that day with his four relatives. They were among a line of small buildings and sheds on a break wall. It forms part of Gaza’s harbour which on previous days had been hit by Israeli fire. The boys were playing hide and seek. Muntaser remembers a round of the game had begun and one of the boys was among the sheds when they came under attack. “We started calling him until the rocket hit him,” Muntaser said. A photographer captured images of the boys running for their lives. He is powerless, but is desperate to be powerful. In Gaza, Israel and Hamas are doing battle in a territory where half the population are children. Officials say at least 145 children have now been killed in the current conflict. “It’s a human tragedy,” Lt Col Lerner said. “Children are not our targets. We do not target civilians. It defeats the object of our mission. But that is cold comfort to Mr Bakr. The Bakr boys were buried by the entrance to a simple cemetery near their home. Mr Bakr says the mourners were too afraid to dig the graves further into the cemetery, on a hill, in case they were seen by Israeli gunboats out at sea. “No more,” he said. “We can’t understand what’s happening around us. Every day there’s a new massacre. Meanwhile, an emergency session of the United Nations Human Rights Council has been told Israel may have committed war crimes in Gaza. The High Commissioner for Human Rights, Navi Pillay, says there is a strong possibility the killing of civilians including children is a breach of the law. Ms Pillay says 147 children have been killed in Gaza over the past 16 days. “Their killing raises concerns about respect for the principles of distinction, proportionality and precautions in attack,” she said. “Israeli children and their parents and other civilians also have a right to live without the constant fear that a rocket fired from Gaza may land on their homes or their schools, killing and injuring them. About 650 Palestinians and 29 Israeli soldiers have been killed in the past 16 days.